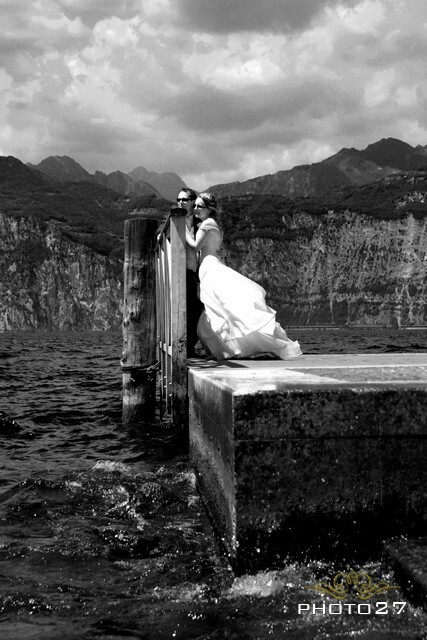 Home » Lake Garda Weddings » Malcesine Weddings » From the infinite past… to Malcesine! Have you ever had the feeling of knowing someone from the infinite past? Definitely these are feelings arising when lovers look into each others eyes, lost in rapture, hypnotized by its vastness. Steve and Sarah flew all the way from UK to find a location that could match their antique and noble acquaintance! What could be a better place than Italy? A country full of story, sharing with its lovers hidden niches of infinite beauty. 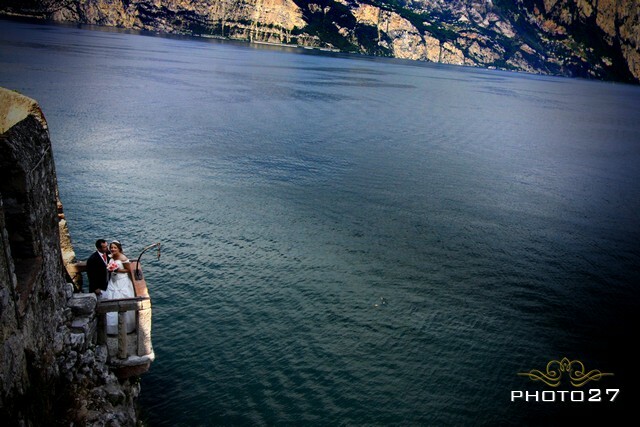 During their visit around the Lake Garda, after visiting many characteristic villages and famous locations,Steve and Sarah came across a tiny well kept village in the North of the Lake called Malcesine. In this location filled with colorful little artisan shops, family run restaurants and the superb surrounding nature, they finally found what they were looking for! 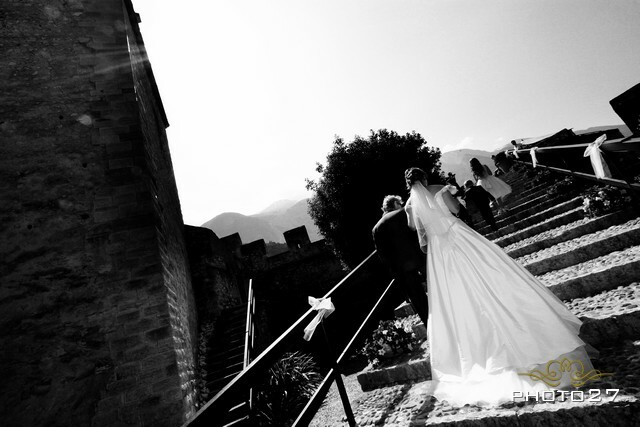 The venue to tie the knot was Scaligero Castle, stately rising from the village promontory! 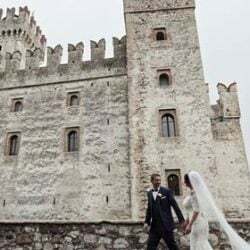 The Castle has a very long and rich history. It had many owners who kept it polished and magnificent through the centuries. It was built in the first millennium by the Lombards and then destroyed and rebuilt by the Franks. 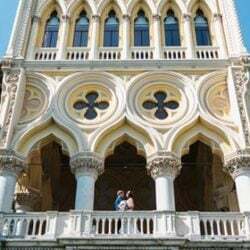 From there on, it has been a jewel in the hands either of Republic of Venice, of Austrian-Hungarian Empire, of France and of many Italian lineages. Then it was declared National Monument in 1206. In this rare pearl set in a fairy tale landscape, Steve and Sarah decided to celebrate their most important event as a couple: their wedding! 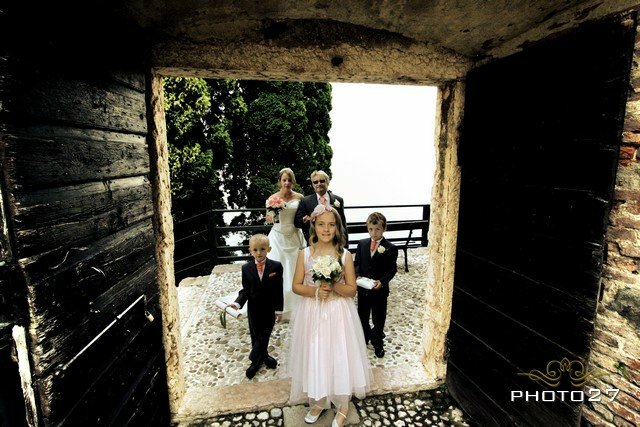 When the day finally arrived, everything was ready for their wonderful ceremony, young page boys and flower girls, cheerful guests were waiting for this very important day. Cascades of flowers were awaiting the couple for their vows exchange! 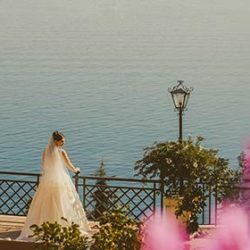 Our skillful photographers from Photo 27 Studio were able to capture unique shots, so delicate and important but so qucik to vanish in a heartbeat. 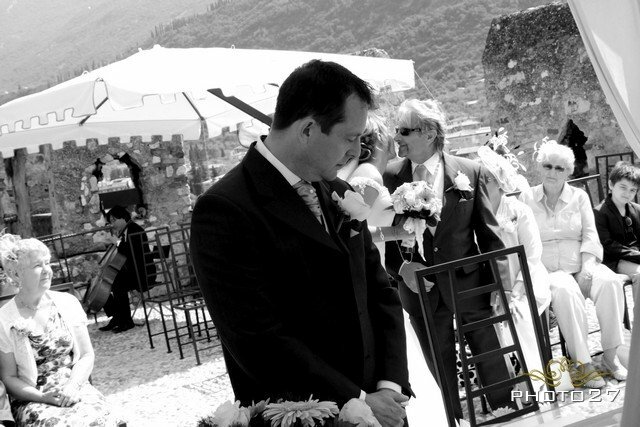 We love especially the following photo, Sarah’s farewell to her previous life and Steve’s waiting, longing to start his new life with Sarah… and finally they exchanged vows and rings! Classical music, played by artists our great Joy Ensemble Duo (Violin and Cello) in the background, added a touch of uniqueness and elegance to their YES! For this special occasion musicians played some classical tunes by their repertoire. Some other were expressively requested by bride and groom as Viavaldi Four Seasons and Fields of Gold by Sting. 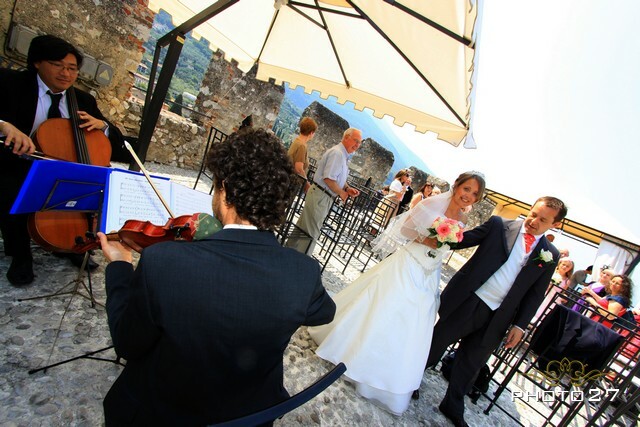 For your wedding in Malcesine Italian Lakes Wedding can provide a wide choice of classical musicians. 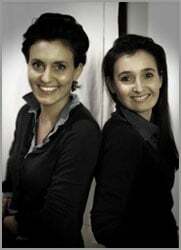 We can start from violin solo, harp solo up to string quartets with even a soprano singer! Now Sarah and Steve are ready for their joined bright future! 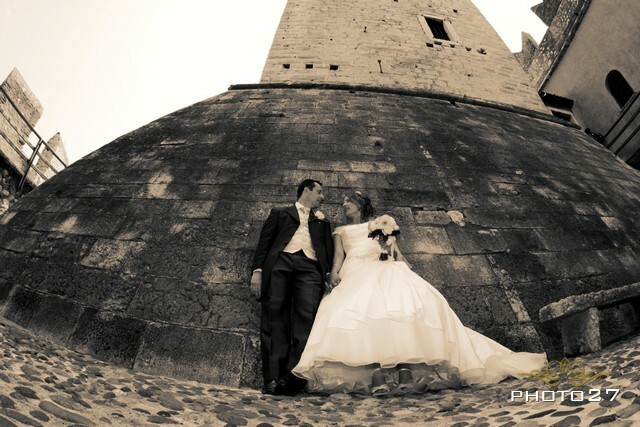 Shooting session started to follow, while their guests could explore the beautiful castle. 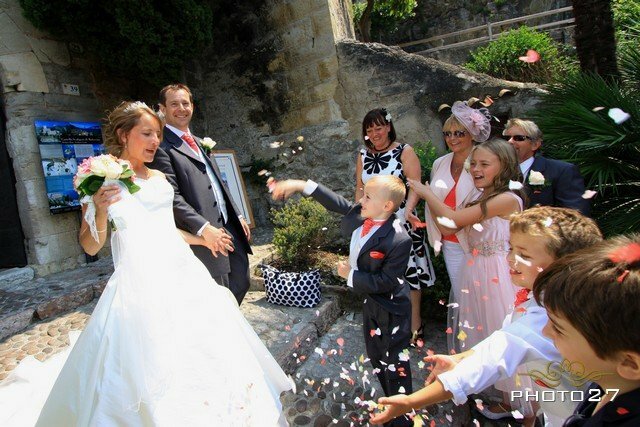 But the most lasting joy comes from the possibility to share your happy moments with your beloved friends and family, and Sarah and Steve had a huge group waiting for them! 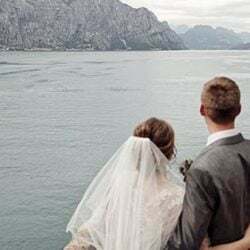 Our skilled photographers of Photo 27 Studio continued to followed them around Malcesine village to capture their most important moments in just a candid and reportage way! 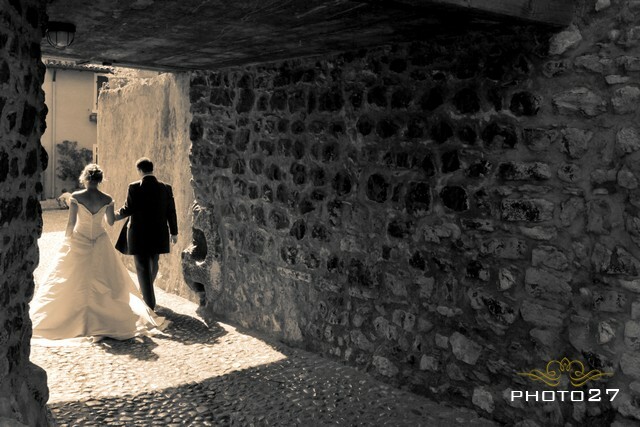 Their professional eyes are trained to capture the most important although sometimes invisible moments, while letting them be natural. Sometimes the work of post production is under estimated, but we find it essential to give back pathos experienced in most important moments. Camera captures colors and shades, our professionals add to them human dimension, drama and magic of life! After the ceremony Sarah and Steve had a chilled and relaxing walk around Malcesine tiny streets and its small traditional and colorful pier. 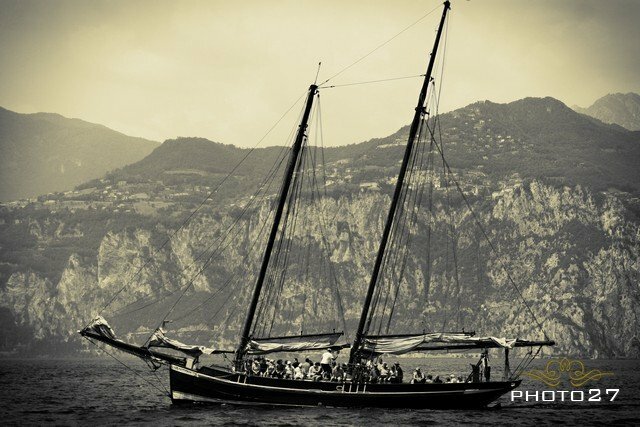 As a great surprise to their guests, an incredible journey on a historical sailing ship from 19th century was awaiting for them! 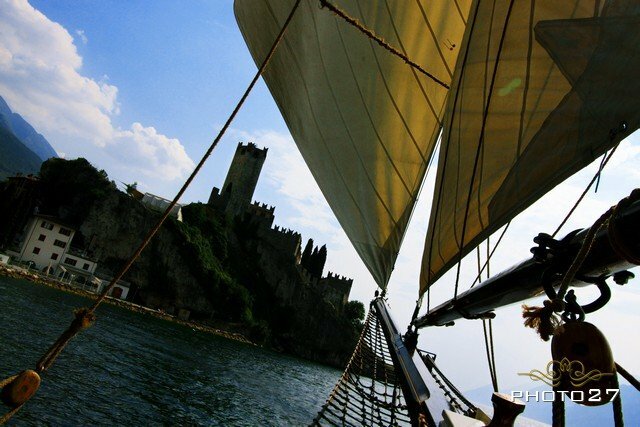 A new breathtaking view of the castle could be appreciated from here! We leave them like this, enjoying their new life together and foreseeing a bright future ahead! We wish them the best life can offer! 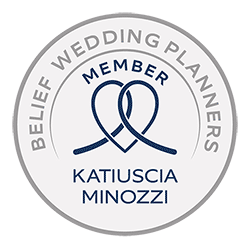 For any information about wedding in Malcesine please contact Angela and Katiuscia.